Category games in Spanish are a fun way to practice vocabulary. I play several games that review vocabulary by grouping words in different ways. I call the printable Spanish vocabulary game below Nombra 3. You can find a free download of 70 game cards at the end of the post. In this Spanish vocabulary game, players draw a card and name 3 things in the category the card specifies. Groupings words by a common characteristic gives students the opportunity to think about vocabulary they know in different ways. Some of the categories fit thematic units, such as Nombra 3 frutas. Others, are not so obvious. 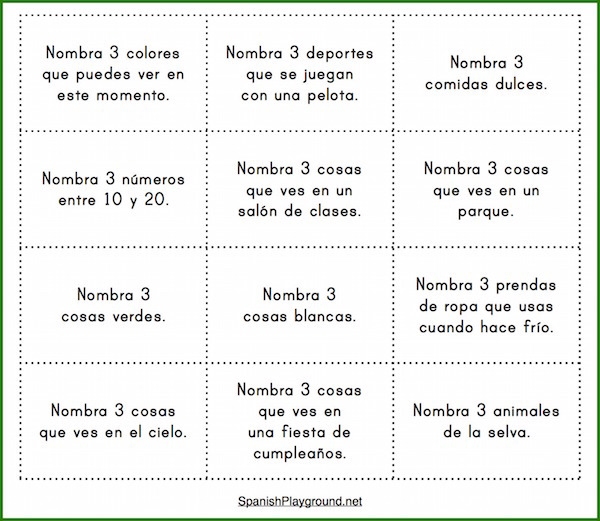 For example, some of the first words my students learn are mano, manzana and mamá, but kids don’t usually think of them as palabras que empiezan con la letra m.
Spanish Playground has other printable word games, too. Check out this Basta game for Spanish vocabulary practice. It has printable game boards with categories for Spanish learners. This printable Spanish vocabulary game where players look at pictures and determine what is missing is another option. Also, this Spanish word-building game is a fun way to practice weather and natural world vocabulary. In addition, we have two Spanish vocabulary games based on Go Fish with an added component of place. One is a printable Spanish card game for house vocabulary called Buscando por la casa and the other is a Spanish game for kids called Encuentra los animales. To play Nombra 3, first choose cards with categories your students have the vocabulary to answer and clarify words they don’t know. There are 70 cards and some of the cards may have unfamiliar vocabulary even if they can answer the question. For example, Nombra 3 prendas de ropa que llevas cuando hace frío. Students may know words for clothes, but not the word prenda. If that is the case, you can underline the word and list it on the board with a definition or translation. You can also reword the question or provide a translation on the card. We play in groups of 3 or 4, but you can also play in pairs. To play, place the cards face down in the center. Also, decide how many cards you will answer in each game if you are going to declare a winner. Players take turns drawing a card, reading it aloud and naming 3 things. I have students read their own card, but you can also have them read to each other. If a student can name 3 things, they keep the card. If they can’t, the card goes back to the bottom of the pile. You can use a timer to keep the game moving faster if you like. You can also play this Spanish vocabulary game in teams as a large group, giving each side 30 seconds to confer before they answer. When I play this way, if a team can’t answer, play passes to the other team. Below you’ll find a list of the categories on the on the cards (in no particular order). There are also blank cards on the printable PDF so you can make your own questions for the Spanish vocabulary game. 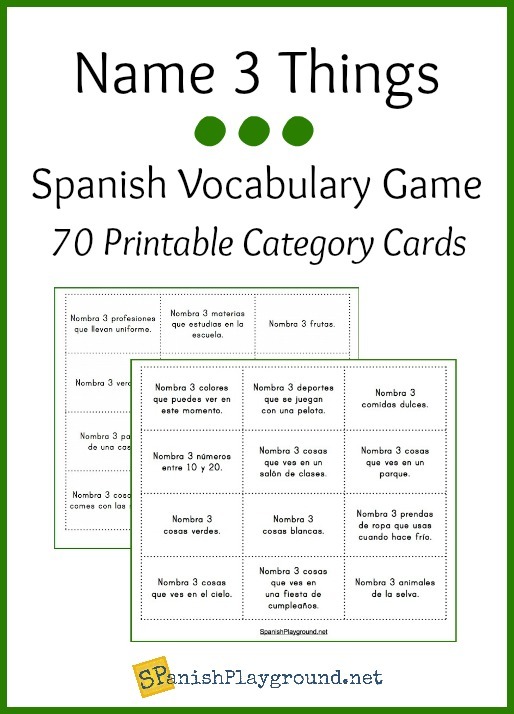 The cards for this Spanish vocabulary game are handy for other activities too. You can use them with board games or to fill a few minutes at the end of class. You can also ask for just one item in the category and have students write their answers on individual white boards. How do you use categories in your classes? Share your ideas in the comments below, or let us know on our Facebook or Twitter. We love hearing your suggestions and how our materials work for you! Thank you for the fun ideas. I needed something to break up the monotony in my class. I know what you mean! Can’t you sense when they need a change so you can keep them motivated? I hope the game is a hit! Isn’t it funny how some groups really don’t like games? I’m glad this activity worked for you! Thanks for letting me know. What a good way to start a Spanish group! I’m glad the game was helpful.